On BH side it is good for shooting. Deception is absent. It is good for attacks and fast games. Control is satisfactory. On the table you can chop but far from table it is very fast to chop. Watch mima ito videos for understanding more. I'm not a pip player but I have no problem playing with it. It is so fun to play with, and it takes very little time to adapt to/adjust to. It can generate a little spin, and this can help fool the opponent quite easily. It is very powerful rubber, perfect on my Clipper CR. I use the thick rubber it on my backhand. Good control. Produces good topspin against backspin. No difficulty in lifting a chop. Fast block attack against flat rubber attack. Can produce heavy chop in defense. Very good control, good spin on backhanded loop and very good for punch. Very good chop block. Fast and good control.This short pips is very good for attacking. Maybe the best short pips. Fast, good control. Spinny. You can do everything. 18/01/2019 Интересные короткие шипы Review by Alexandr S.
Взял эти короткие шипы на пробу в толщине 1.4 на BH, также можно использовать и на FH. Шипы интересные, можно вращать, бить плоско, принимать сложные подачи. Для соперника не слишком опасны. Подойдут не каждому. Такими шипами слева играет молодая японская звезда Мима Ито и играет очень успешно. The thin sponge (1.5mm) was good only for all out attack. It was good in a flatter counter attack. There was less control against heavy topspin. There was good control, but insufficient power against chop. There was very poor control in chopping against a topspin attack. The thick (1.8mm) rubber was very good all round in attack, counter attack, against chop and when chopping against topspin attack. There was also good control against all types of pimples. A problem is that it is often out of stock. I used Donic short pips rubber when I first started playing pp when I was 65 years old, the reason was every senior player was using it. I just copied them. But, they have played for years, and I just started. Then my first coach asked me to use Tenrgy 05 on both sides.Five years later, I tried short pips one more time, but I still did not like it. Then I started reading about Mima Ito's equipment, she is using the Maristo SP for her bh, and she had a very successful year. Then He Zhuojia, came out from nowhere, and almost beat everyone at the ITTF Grand Final at Korea. 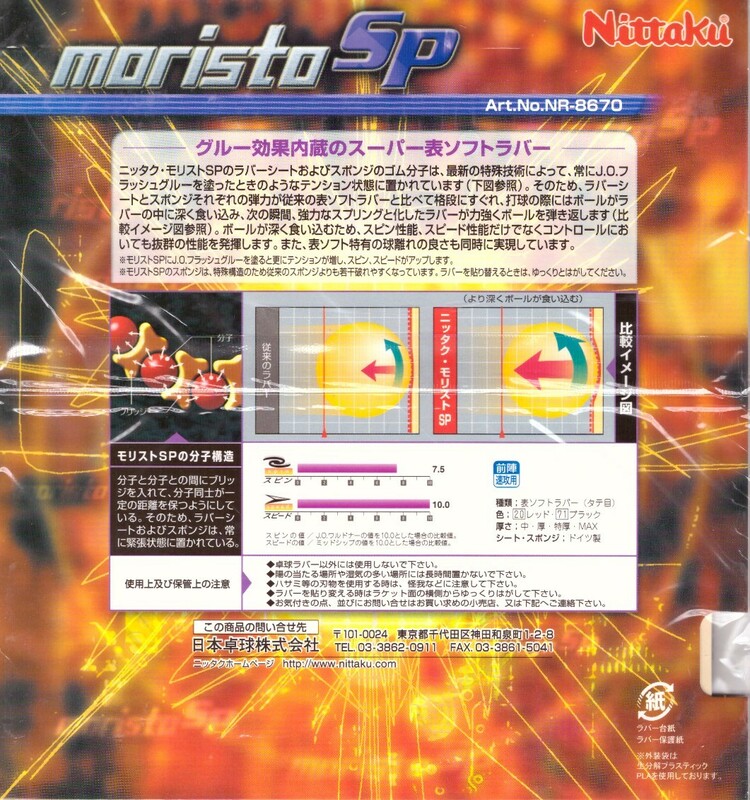 She also used Moristo SP for her bp. I have been copying the Japanese women's styles for two years now, because I am small and old (over 70), and the JW styles fit me perfectly. I have used the new short pips as my backhand for only a few weeks, and I have beaten people that I have never beaten before. It is an excellent for the bp, u have to hit the ball early, on the rise, and aim low. i aimed the ball at the white line of the net, and now i don't push on my bh anymore. I can flip any short balls, tp, up,sp. For long balls, u just whack at it. The ball has no spin and it is extremely hard for your opponents to hit it back. I love it. I am trying it on a new bat now. I haven't tried too many different short pips, but Moristo seems to be an allround good performer. It can spin like newer pips, and still flat hit. I use it on the backhand so almost never serve with them. The control is excellent compared to Spinpips red or Spectol red, both those are much faster and bouncier than Moristo. 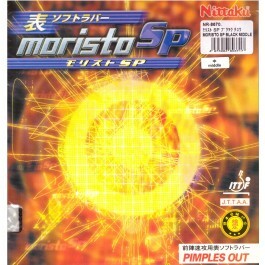 One thing, Moristo is spin-sensitive, so if you are looking for pips to not have to read the spin, that won't work with these. But compared to an inverted like Tenergy or Evolution series, receiving serve and handling incoming spin is still much easier. Tt11 is quick on shipping as always and is willing to accommodate special requests. Thumbs up for their services. This rubber is great for control, spin drive and flat smashes. Not good for producing spinny attacks as all short pips are like. If you want spin, go for smooth rubbers. Отличные короткие шипы для современной игры. Легко поднимать подрезки топспином. удар получается с не очень сильным вращением но с приличной скоростью и неприятный для соперника. Очень легко играть блоками на столе. Подходит для многих оснований. shipi otlicno igrajut na BH. Control of this short pips is excellent. The knuckle effect on forehand smash is unbelievable.Doing the top spin is easy .Overall it is a good rubber for an offensive player. Good produt and very fast delivery!